When Should I Contact a 1031 Exchange Expert? As a property investor, you need to know about the available 1031 exchange options as well as the impact of timing on these transactions. This valuable information will position you to keep your money working for you. 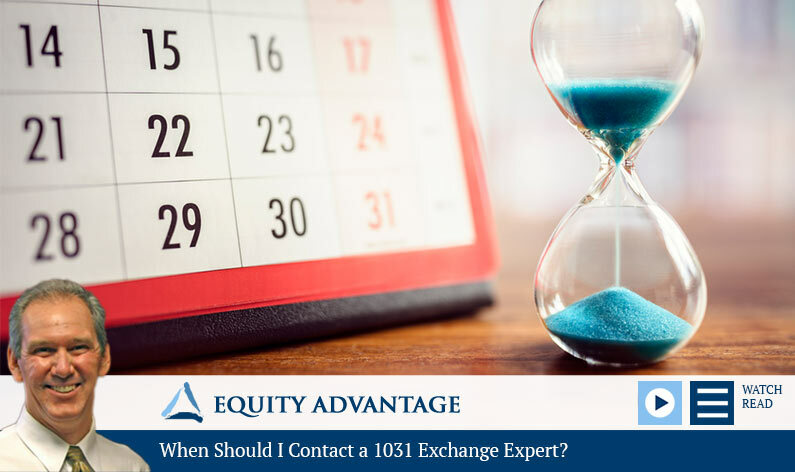 David Moore, Equity Advantage 1031 exchange expert, looks at the possibilities and the best way to maximize your options. This is something that is often left to the 11th hour. Ideally, the time to contact an exchange expert is when you buy a property because your ownership is going to dictate what options you have available going forward. Most people don’t even think about it at the time they buy the asset, however. More often than not we don’t hear from people until they have a sale pending, which makes matters difficult. It’s essential to contact a 1031 exchange expert before closing. If you have actual or constructive receipt of the funds, you’re going to have tax exposure. That means if you have a closing and money is escrow, you have the ability to touch the money, and you’ve got a taxable event. We need to make sure the exchange is set up prior to closing. It’s best if we can talk as soon as you decide to sell it, because then we can evaluate how the property is owned and figure out where you want to go. If we don’t hear about it until the deal is in escrow, then it’s going to eliminate some of the opportunities we have for you. I recently spoke with a client who is relinquishing a number of properties. They wanted to know what it would cost, but it’s not possible to provide an immediate answer. We don’t know if it’s going to be a reverse exchange, delayed exchange, improvement exchange, or a swap. It could be any combination of those things. We’d like to get them all closed before the acquisition, but a delayed exchanged is also an option. A lot of times, however, we might have to do what we would call a blended transaction. You’re going to sell whatever you can prior to the acquisition. We’ll then close on the acquisition and we would warehouse the replacement. Let’s say if we had four left that hadn’t closed, we’re going to either have to warehouse those four properties via reverse exchange or we can take a tenancy and common ownership in that new property. Regardless, any time it’s an exchange, you only have those 180 day windows to get things done, so planning it out is the best way to do it. Planning is paramount. If you’re going to go scuba diving, the whole idea is you plan the dive, dive the plan. If you’re a pilot, you file a flight plan. Real estate isn’t any different. Planning is key, particularly when we’re talking about your retirement. You’ve worked hard to make the money. It’s our job to help you keep your money and keep it working for you. When it comes to exchanges, the biggest favor you can do yourself is to call and ask these questions early rather than later. Given time we can accomplish a lot. If we’re just picking up the pieces at a closing, you can give us a call today and be closing this afternoon. We can probably get the deal together, at least if it’s a delayed exchange, but potentially you’re going to have some other issues that might come up. If you just give us more time (such as when you buy the property or when you first contemplate a sale), it’s going to make life a lot easier for everyone involved, and, more important, will allow you to maximize your opportunities. What 1031 Exchange Options Might Be Available to You? Time is the major element of consideration. We need to be able to look at it and understand what you’re trying to do. If we have the time to figure it out, we might look at it and do a delayed exchange. We might do a reverse exchange. You might have an idea for using some residual funds. You may be considering some improvements to the property that you’re going to buy—that’s an improvement exchange. All of these options are possibilities. We can also combine different structures, but, again, it takes time. In short, the more time we have to work with, the greater chance of success through the transaction. Never hesitate to ask question. If you’ve got questions and concerns please give us a call, even if you’re working with someone else. If you’re not getting the answers you need, we’ll do what we can to help you out. 1031 exchanges are complex, using an exchange accommodator like Equity Advantage puts a professional in your corner who knows all the rules. It just takes a phone call to get started, 503-635-1031.